Plantar fascitis is a very common, painful foot disorder that involves inflammation of a ligament on the bottom of the foot that is known as the plantar fascia. 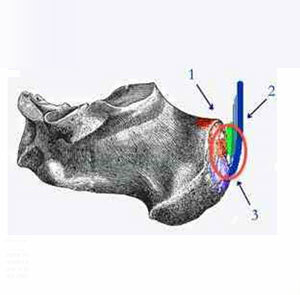 This ligament attaches to the bottom of the heel bone and extends under the arch towards the toes. It is best thought of as a thickened rubber band. In the past, problems in this area were referred to as heel spur pain. 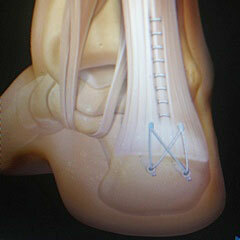 Doctors centered all of their treatment on the development of the boney spur that occurs to the bottom of the heel. However, contemporary thought points to the fact that a structural alteration occurs specifically to this ligament that causes pain and inflammation. The presence or non presence of a boney spur is not in fact the cause of the pain on the bottom of the heel. Presently, the term plantar fasciitis is therefore synonymous with heel spur syndrome. 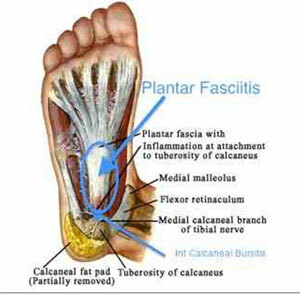 The cause of plantar fascitis is sometimes difficult to determine, however it may result from various factors, some of these being the overall foot structure, certain metabolic diseases, or a change in your activity level or training method. Most people with plantar fasciitis complain of sharp pain following rest. Just getting out of bed in the morning, or from a chair after hours of working can be very painful and challenging. The most painful time is in the morning when first rising from bed and generally the pain decreases as the day goes on. The most common location of the pain is on the bottom of the heel with this pain extending into the inner side of the arch. It may feel like a simple soreness or an extreme sharp pain. Often times people refer to their condition as a "stone bruise". This is a very common problem and it generally occurs to people in their most active years, but can occur at any time. The most common symptom that one presents with is pain in the bottom of the foot. It may extend from a simple soreness to that of a severe pain that may cause even a limp. Initial self-treatment involves methods to temporarily reduce inflammation as well as to allow for appropriate stretching of soft tissue structures that would improve the function of the plantar fascia. Examples of this would be use of ice therapy and various creams and ointments. Various devices have been constructed to relieve pain in the heel region. If most of the pain is underneath the bottom of the heel, not extending into the arch itself, heel cups may prove extremely beneficial. 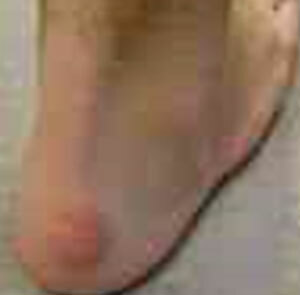 In many cases patients will have a flat foot and if that is prominent a more supportive orthotic device is beneficial. With more of a high arched foot a more flexible shock absorbing type of orthotic would prove more beneficial. In most cases of plantar fascitis the use of an appropriate night splint for the actual stretching of the plantar fascia as well as the Achilles tendon proves to be extremely beneficial with used in conjunction with other therapies. However, if these initial steps prove to be unsatisfactory, professional podiatric medical evaluation is necessary. Examination would include lower extremity exam together with obtaining possible radiographs. Conservative care should be initially instituted and this may involve use of oral medication or injectable Cortisone as well as various physical therapy modalities. Night splints are of paramount importance. Proper shoe gear is also important. The use of possible customized orthotics may be necessary and various conservative therapies as stated above may need to be continued. The possibilities of other causes for heel pain need to be evaluated, such as as calcaneal stress fractures and tarsal tunnel syndrome. A calcaneal stress fracture is a subtle break of the heel bone that is often times difficult to see on x-ray. MRIs may be required for appropriate diagnosis for this reason. 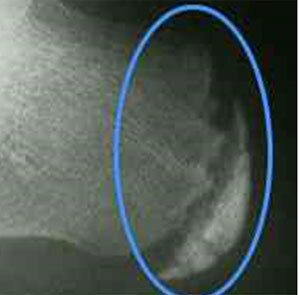 Stress fractures of this bones are sometimes seen in runners and diabetics have an increased frequency of this problem. Tarsal tunnel syndrome is synonymous with carpal tunnel syndrome of the wrist. It is a condition where the nerve on the inner side of the ankle is compressed causing pain to radiate toward the heel. More aggressive conservative therapy may include the use of platelet rich plasma injections or shock wave therapy. If these therapies prove to be unsuccessful, then surgical intervention may be suggested. There are several methods. One of these methods is endoscopic plantar fasciotomy. With this modern technique the surgeon takes a very small cut on the inner side of the heel and inserts the specially designed instrument that allows the plantar fascia ligament to be isolated as well as visualized on the television monitor. The ligament is then selectively severed in order to decrease its pull and this allows it to be elongated to a more functional position, thus reducing the pull and the subsequent inflammation. Other contemporary methods also involve the use of small incisions for the treatment of this particular condition. In many cases the use of a walking boot is necessary during the post-operative course as well as the continued use of the Night Splint. The majority of people prove to do quite well with these particular procedures and are able to quickly return to most of their normal functional activities. Haglund's deformity is an enlargement of bone that occurs in the back of the heel. It affects the heel bone. It is found just adjacent to the Achilles tendon. Normally, it is palpable and oftentimes it becomes red and inflamed causing pain in this area. There are times when this particular problem is actually found in combination with a painful spur as well as inflammation of the Achilles tendon on the back of the heel. Various things can cause this problem, including the overall shape of the foot. This problem is not uncommon in a high arched foot. It has been found that many patients with this problem have some contracture of the Achilles tendon which leads to increased pain in this region. The treatment for this condition involves reducing inflammation from this area often achieved by either elevation of the heel, shoe modification, a possible bimechanical control via the use of an orthotic. Other devices are available that can stretch the Achilles tendon, such as a night splint thereby reducing inflammation, as well as devices that provide silicon shielding to this area. The treatment for this condition would involve reducing the inflammation by attempting to elevate the heel with a heel lift. Biomechanical control of the foot via the use of an orthotic is often quite beneficial. When conservative care, such as stretching and ice, is not effective, then professional consultation is required. At this time therapy may involve obtaining x-rays, possibly even in some cases MRIs or CAT scans. This will aid in determining the specific diagnosis. Oral anti-inflammatory agents are sometimes tried, sometimes injectable in selective cases, such as Cortisone, may prove to be beneficial. This is done in selected cases. In chronic cases with persistent pain and with deformity of either bone or tendon, surgical intervention can be effectively performed. This now involves may new medical technologies that includes the use of bone anchors following the removal of the bony growth from the back of the heel to reattach the Achilles tendon into its proper position. An animation involving this procedure is available. Decubiti are ulcers that generally are found on the back of heels. Ulcers are breaks in the skin that may just affect the skin or possibly penetrate as deep as the bone itself. They generally occur in the elderly or the informed. Usually people who have been at bedrest for an extended period of time. These ulcers can and often become quite serious. They can become infected. In person professional medical attention is needed. Often times surgical treatment may eventually be required. Limb salvage techniques need to be employed. The principle goal of treatment is prevention. This can be accomplished by off loading- or removing any pressure from the back of the heel. By doing this the problem could be prevented as well as its progression could be slowed. Heel suspension device functions very well in this capacity. Bursa is best described as a small sac-like shock absorber filled with fluid. Bursae are common throughout the entire body. Some of them are always present and others develop as a result of some increased stresses on tissues. 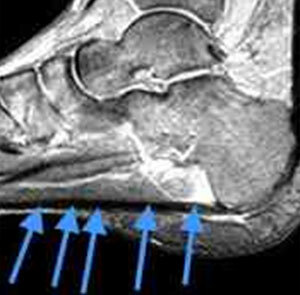 Two of the most common bursae that are afftected by sports related injuries are located in the heel. One is located below the heel, inferior calcaneal bursa, and one is located behind the heel in front of the Achilles tendon, the retrocalcaneal bursa. These areas are often times quite inflamed and they can cause significant pain. Please take note that in the diagram to the right, 1 is Bursa, 2 is Achilles tendon, 3 is where the Achilles inserts into the bone. Pain that is directly beneath the bottom of the heel is often times associated with inferior calcaneal bursitis. Doctor recommends several products as a first step in treatment like heel cups. Often times heel bursitis is associated with plantar fascitis and when these conditions coexist an insole and a night splint often prove to be of significant help in reducing pain. If the bursitis remains chronic, in person professional medical attention is necessary. Treatment will involve the use of oral or injectable medications to reduce the inflammation. With this condition, you would generally not have any pain along the side of your heel, nor will there be any swelling of your heel. However, if you do have pain along the side of your heel, or swelling, the possibility of a stress fracture needs to be considered. This would require immediate in person professional medical attention. Pain that is located directly behind the heel at the junction between the heel bone and the achilles tendon is called retro calcaneal bursitis. If you have this condition you will feel pain in this area. There may even be pain that is tied to the range of motion in your ankle. This is not an uncommon problem. Therapy for an athlete would require cessation of that specific sport. Various alternative sports may be attempted. A runner may be able to convert their aerobic activity to that of swimming or cycling and this alteration of activity may prove helpful for the development of strength in other regions. Common term for a bump on the back of the heel that is often synonymous with Haglund deformity. 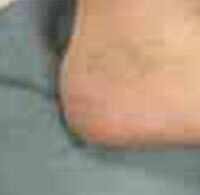 This enlargement can cause increased irritation when the patient is wearing various shoe types that cause pressure on the back of the heel, such as a pump. The effective treatment for this condition is well outlined in the section devoted to Haglund deformity. In the very beginning the patient may develop some mild redness along the back side of the heel bone. This could occur in either one or both of the heels. As the pressure from the bed rest increases and as added pressure develops blistering may ensue and if intervention is not undertaken then the irritation becomes more progressive and this can lead to the development of skin breakdown. As this progresses the opening in the skin can reach various levels. In the most severe cases brown to blackish thickening of skin can develop and the actual penetration of the ulcer or bed sore can penetrate the heel bone itself. This condition is common in many patients that unfortunately require prolonged bed rest. Other metabolic diseases, such as diabetes and some neurological problems such as recent stroke, are most commonly affected by this type of problem. In a diabetic the foot is fairly numb and the patient does not perceive any discomfort. Therefore, the process continues until it is visualized by some aid or family member. All first step treatment involves the process of off loading. Though it sounds easy to do the heels need to be suspended off the bed surface. Heel suspension devices have been created that would ease in the prevention of this type of problem as well as the prevention of progressive problems, especially when found at an early stage. If infection develops, reddening, swelling and drainage or malodor, this does require specific consultation on a professional basis. If blackening and redness develops this should be treated as soon as possible to prevent any potential limb loss possibilities, especially in the diabetic person. After medical attention for this problem, the wound may require surgical debridement for cleaning together with drainage and obtaining cultures of the organism that may be causing the infection. Specialized x-rays and possible scans would be needed to determine whether the deeper structures are infected. Surgical intervention may be required, depending upon the extent of the internal damage. A multi-specialty team is usually needed in order to provide efficient treatment for more complicated cases. This may also involve vascular specialists, especially in cases of poor circulation. This is a condition that often affects adolescent children. Symptoms include pain toward the back of the heel. This condition is often seen in active children participating in various sporting activities. In the growing child, a bone plate exists that is often called an epiphysis. When a tendon attaches to an epiphysis, this is referred to as a apophysis. 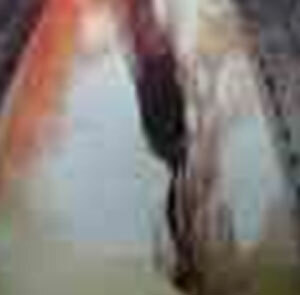 A photo of the calcaneal apophysis is shown above. When inflammation of this area occurs, we refer to this condition as calcaneal apophysitis. It is also referred to as Sever's Disease. People sometimes refer to this type of pain as "growing pains". First line treatment can involve the use of icing, reduction of activities, and simple stretching techniques. Often times the use of a supportive insole prove to be beneficial as well. In many of these cases, a night splint used in conjunction with the above proves to help relieve the symptoms. If symptoms continue to occur, it is recommended that you seek in person professional medical attention. Medical history will be obtained, x-rays will be taken in order to rule out other potential causes of heel pain. Further treatment generally involves the possible addition of customized orthotic devices, and possibly the use of simple oral anti-inflammatory agents to relieve the pain. In more severe cases, immobilization techniques such as casting may be necessary. Heel fissures is an uncomfortable problem. It is extremely common. The tissue around the periphery, or edge, of the heel generally becomes calloused and then as the skin becomes more dry in this region, various small cracks develop. These cracks may enlarge and become deeper and as they do the edges of the thickened skin seem to become more prominent and this leads to the painful development of heel fissures. This condition requires careful attention and treatment. Doctors recommend a combination of therapies, including the buffing pad and creams. The creams should be applied at night to promote further penetration of the cream. It is also recommended that the patients refrain from the use of any type of sandals or open toed shoes as these type of shoes often promote increased dryness of the foot and prevent normal hydration that is often needed in this condition. Therefore, closed shoes would be recommended with appropriate socks. The best socks are those that promote aeration as well as allow for proper absorption and dispersion of moisture.